The price tag to keep Asian carp out of the Great Lakes nearly tripled following an announcement by the Army Corps of Engineers last week. 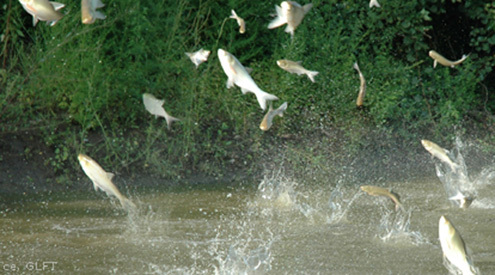 The Corps released their “final environmental impact and feasibility study,” which found the total cost of implementing the plan to keep Asian Carp out of the Great Lakes at the Brandon Road Lock and Dam, the last choke point to stop the carp, to be $778 million — an increase from the $275 million originally estimated. Michigan boasts a $7 billion annual sport fishery — a fishery that could easily disappear with the introduction of the invasive carp in our waterways. The $778 million pales in comparison to what we could lose if legislators drag their feet on appropriating this funding, Michigan United Conservation Clubs Executive Director Dan Eichinger said. Gov. Snyder, Michigan legislators and stakeholders in Michigan have been calling for swifter action on Asian carp for more than a decade, and those invested, including Gov. Snyder, have vowed to pony up the majority of costs to implement the plan. While there has been some agreement of cost-sharing on the project with Illinois and other states, this “sticker shock” should not derail the project, said Tammy Newcomb, water policy advisor for the Michigan Department of Natural Resources. Illinois Department of Natural Resources Spokesman Ed Cross said a further examination of how this project will reduce the threat of Asian carp entering the Great Lakes will now be needed with the increased price tag. “Now that the cost has nearly tripled to $778 million, we need to have a better understanding of how this project, with all the proposed components, actually reduces the risk of Asian carp and other invasive species getting into our Great Lakes in a fiscally responsible manner,” Cross said. Whatever the cost, to Michigan or any other state, the Great Lakes cannot afford to have inaction, Eichinger said. The current plan, dubbed the “gauntlet” by some, includes an underwater channel with an electric barrier, noisemakers and devices to release air bubbles that would deter the fish from entering Lake Michigan. The Army Corps of Engineers will be accepting public comment until Dec. 24, and a finalized plan is expected to be delivered to Congress in February. If appropriations are approved, the project at the Brandon Road Lock and Dam would be completed between 2025 and 2027. I just seems to me that if the states were to put a value on carp ($/lb), and allow for unlicensed commercial fishing, this would resolve the problem very quickly. The fish could be sold for pet food and fertilizer. Or, shipped overseas where the could be consumed. can someone please answer the obvious question… WHY has the cost tripled from the original estimate? ?